May be associated with swelling of the face. Caused by edema and cellulitis or sometimes connected with fever and body discomfort. Usually when the face swells, pain diminishes in intensity due to rupture of the pus through the periosteum of the bone around the affected tooth and the consequent decrease in pressure of tooth apex. 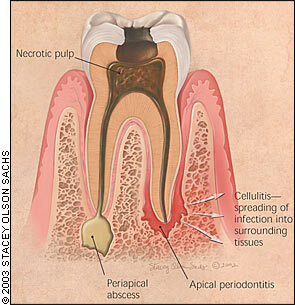 The cause of food impaction is usually a faulty contact between the teeth because of decay or poor restorations. 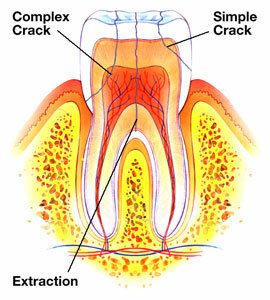 Examination shows a faulty contact between the two teeth and often food trapped between these teeth, and the gum flap between the teeth involved is tender to touch and bleeds easily. Acute infections around the crowns of teeth are common and are related to incompletely erupted teeth partially covered by flaps of gum tissue (operculum), particularly lower third molars or wisdom teeth. Pain is spontaneous and is often worsen by closing the mouth. In more severe cases, pain may be aggravated by swallowing and there may be trismus (limited mouth opening) and occasionally fever, swollen lymph nodes and body discomfort. Examination shows an operculum that is acutely inflamed, red and swollen. Frequently, an opposing upper tooth indents or ulcerates the swollen operculum. Examination shows necrosis and ulceration of the gums in between teeth in different degrees of marginal gum destruction. Similar features but with more intense pain may be seen in necrotizing periodontitis in HIV/AIDS. 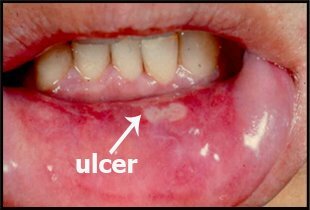 Pain from oral mucosal lesions can either be localized or diffuse, localized pain is usually associated with an erosion or ulcer. Diffuse pain may be associated with a widespread infection, mucosal atrophy or erosion, a systemic underlying deficiency disease or other factors, and is usually described as ‘soreness’ or sometimes ‘burning’. Mucosal pain may be aggravated mechanically by touch or by sour, spicy, salty or hot foods. Pain from the jaws can be caused by acute infection, cancers, Paget’s diseae and direct trauma. Lesions such as cysts, retained roots and impacted teeth are usually painless unless associated with infection orfracture of the jaw. Odontogenic and other harmless tumors of the bone do not normally produce pain, but cancerous tumors usually produce deep, boring pain, sometimes associated with paraesthesia (partial numbness), hypoesthesia (decreased sensitivity) or anesthesia (complete numbness). Radiation therapy or bisphosphonate may result in severe jaw pain due to infection associated with osteonecrosis.